Sweden sat back on their advantage and, despite the hosts enjoying 76% possession, they failed to find the breakthrough - Italy's best chance saw goalkeeper Robin Olsen palm away substitute Stephan El Shaarawy's thumping late volley. Striker Ciro Immobile missed a number of chances and his low effort in the first half was cleared off the line by centre-back Andreas Granqvist. The result sees Jan Andersson's Sweden side reach the World Cup for the first time since 2006, when they were in the same group as England. Which teams have qualified for Russia? While Italy dominated the second leg and had 20 shots at goal, their exertions radiated a growing sense of desperation. Giampiero Ventura's side were unable to carve open a resolute Swedish defence which sat deep and often had a line of six defenders camped in their box, heading away each cross and set-piece into the box. In all, the Swedes made a total of 56 clearances between them, plus 19 interceptions. Both sides could have been awarded penalties: first Ludwig Augustinsson brought down Marco Parolo with a clumsy challenge while Manchester United's Matteo Darmian and Juventus veteran Andrea Barzagli were fortunate to escape with handballs for Italy. Lazio striker Immobile, who has 14 club goals this season, hit the side-netting from a tight angle early on and struck a first-time shot wide from close range in the second half. 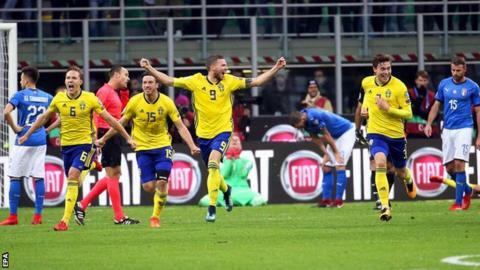 At the other end, Sweden keeper Olsen saved well from midfielders Jorginho and Alessandro Florenzi, who also clipped an acrobatic volley narrowly wide. Many of the Italy players fell to the ground at the full-time whistle, with strikers Andrea Belotti and Immobile reduced to tears, as the Swedes ran off to enthusiastically celebrate their qualification for next summer's tournament in Russia. Did goalkeeper Gianluigi Buffon and coach Gianpiero Ventura feature in their last Italy game together? Italian newspaper Gazzetta dello Sport described the loss as akin to the "apocalypse" in their headline for the match report. Captain Gianluigi Buffon was earning his 175th cap for Italy and the 39-year-old goalkeeper confirmed it was his last international appearance, having announced his decision to retire from football at the end of the season. AC Milan's highly-rated 18-year-old Gianluigi Donnarumma was on the bench and the teenager, who already has four caps, is in line to take over the number one shirt for the next campaign - qualifying for the 2020 European Championship. It may also be the end for coach Ventura. The 69-year-old manager reportedly refused to give an interview to television after the match. He received much criticism for his decision to play a 4-2-4 formation against Spain, when his side were heavily beaten 3-0, and will once again be asked questions why he refused to play Napoli's Lorenzo Insigne, who has six goals already this season for his club side. Ventura was given a new contract until 2020 only in August, but the Italian football association could now turn to former AC Milan and Juventus manager Carlo Ancelotti who is available after leaving German champions Bayern Munich. Former Wigan defender Granqvist, who was man of the match in the first leg, put in another colossal performance at the back for Sweden. The 32-year-old said: "For my part, this is the biggest thing that has happened to me and for those of us that are older this is probably the last chance to play at a World Cup so to succeed in those circumstances is an unbelievable joy." Shortly after the match, skipper Granqvist was seen sporting a new haircut because of a promise made earlier in the qualifying campaign. He added: "I said to the lads in the dressing room that if we got to the World Cup they could shave it off. I thought they had forgotten it, but John Guidetti and Victor Lindelof shaved it off straight away,"
Match ends, Italy 0, Sweden 0. Second Half ends, Italy 0, Sweden 0. Offside, Italy. Federico Bernardeschi tries a through ball, but Giorgio Chiellini is caught offside. Attempt blocked. Federico Bernardeschi (Italy) left footed shot from outside the box is blocked. Corner, Italy. Conceded by Ludwig Augustinsson. Attempt blocked. Alessandro Florenzi (Italy) left footed shot from the right side of the box is blocked. Robin Olsen (Sweden) is shown the yellow card. Attempt missed. Jorginho (Italy) right footed shot from outside the box is close, but misses to the left following a corner. Corner, Italy. Conceded by Andreas Granqvist. Federico Bernardeschi (Italy) is shown the yellow card for a bad foul. Ciro Immobile (Italy) is shown the yellow card. Foul by Federico Bernardeschi (Italy). Sebastian Larsson (Sweden) wins a free kick in the defensive half. Attempt missed. Leonardo Bonucci (Italy) header from the centre of the box misses to the right. Assisted by Giorgio Chiellini with a cross. Foul by Andrea Barzagli (Italy). Attempt missed. Marco Parolo (Italy) header from the centre of the box misses to the left. Assisted by Alessandro Florenzi with a cross. Attempt saved. Stephan El Shaarawy (Italy) right footed shot from the left side of the box is saved in the top left corner. Assisted by Ciro Immobile with a headed pass. Attempt blocked. Federico Bernardeschi (Italy) header from the centre of the box is blocked. Assisted by Alessandro Florenzi with a cross. Attempt missed. Andrea Belotti (Italy) left footed shot from outside the box is close, but misses to the left. Assisted by Marco Parolo. Hand ball by Isaac Kiese Thelin (Sweden). Offside, Sweden. Emil Forsberg tries a through ball, but Marcus Berg is caught offside. Offside, Italy. Marco Parolo tries a through ball, but Ciro Immobile is caught offside. Attempt saved. Marco Parolo (Italy) header from the centre of the box is saved in the bottom left corner. Assisted by Alessandro Florenzi with a cross. Jorginho (Italy) wins a free kick in the attacking half. Attempt missed. Marcus Berg (Sweden) left footed shot from the centre of the box is too high. Attempt missed. Alessandro Florenzi (Italy) right footed shot from the right side of the box is too high. Giorgio Chiellini (Italy) wins a free kick on the left wing. Foul by Marcus Rohden (Sweden). Attempt saved. Antonio Candreva (Italy) right footed shot from outside the box is saved in the centre of the goal. Assisted by Andrea Barzagli. Substitution, Sweden. Marcus Rohden replaces Viktor Claesson. Corner, Italy. Conceded by Mikael Lustig. Andrea Belotti (Italy) wins a free kick in the defensive half. Foul by Ludwig Augustinsson (Sweden). Attempt blocked. Emil Forsberg (Sweden) right footed shot from outside the box is blocked. Assisted by Viktor Claesson. Attempt blocked. Alessandro Florenzi (Italy) right footed shot from outside the box is blocked. Assisted by Andrea Belotti.